Poringland is a very large village to the south-east of Norwich, merging into Framingham Earl to make what is really a small town. 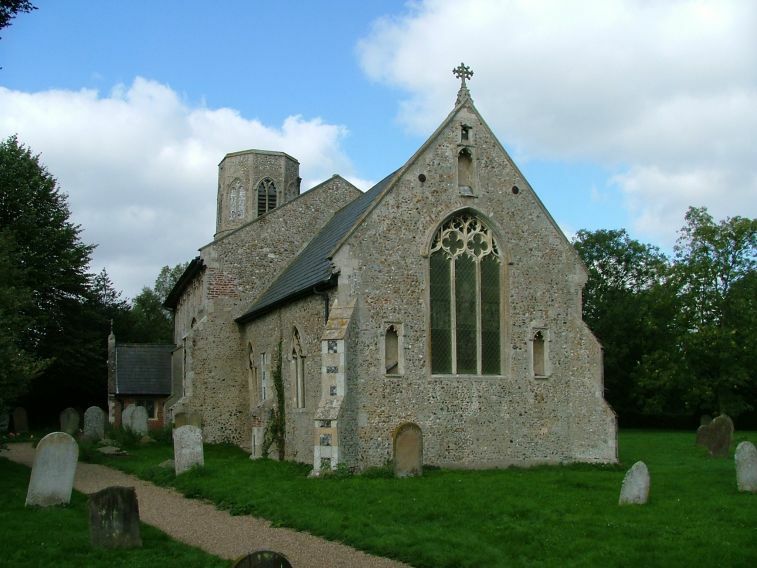 The big church of All Saints sits up on the main road, at an angle to it, presenting its fine 14th century chancel to the world. Two image niches flank a window which was blocked up for several hundred years, finally being cleared in the 19th century. 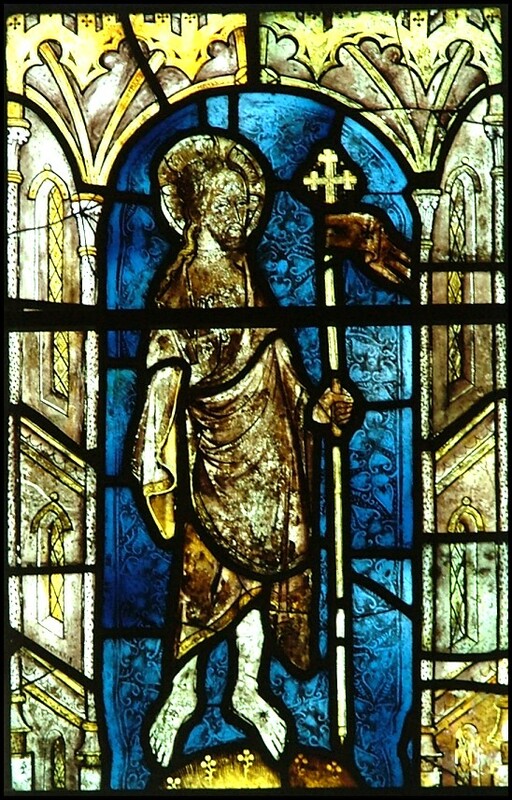 The side windows of the chancel are even more elaborately Decorated. All Saints is one of those churches which really does repay a considered exploration of its outside. It gives up its secrets quite easily, and provides a story of its development over the centuries. Obviously, the earliest part of the building here is the lower stage of the round tower, which is certainly Norman, despite the slightly later window on its west side. There are not many round towers in urban settings; there must have been many more, but most were replaced later by square towers. That did not happen here, possibly because Poringland's tower is such a handsome one. 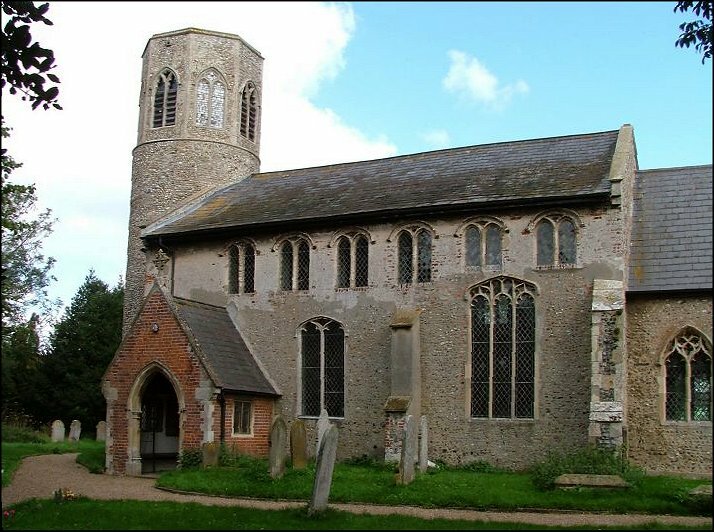 But if All Saints is a grand and singular church, then this is because of its nave, which is quite like any other in Norfolk. As Mortlock observes, there must have been work going on here pretty well continually from the mid-14th century to the mid-15th century. 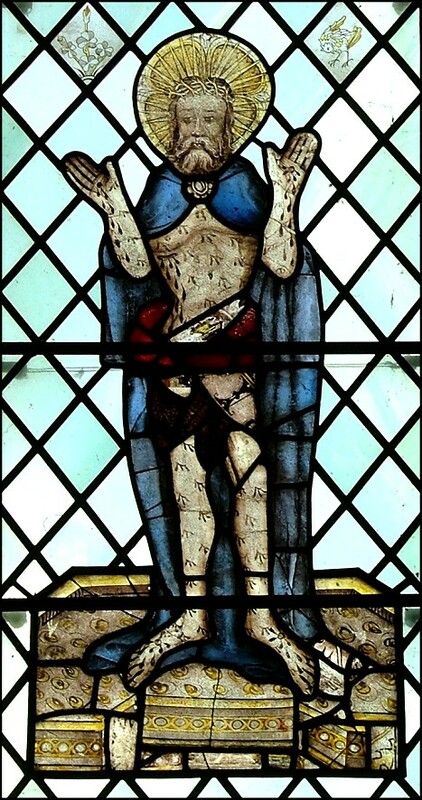 At some point in the middle of this period a massive window was built at the east end of the south wall, and then in 1450 the walls were raised and the striking clerestory, picked out in red brick, was put in. The windows needed to be smaller above the big window. 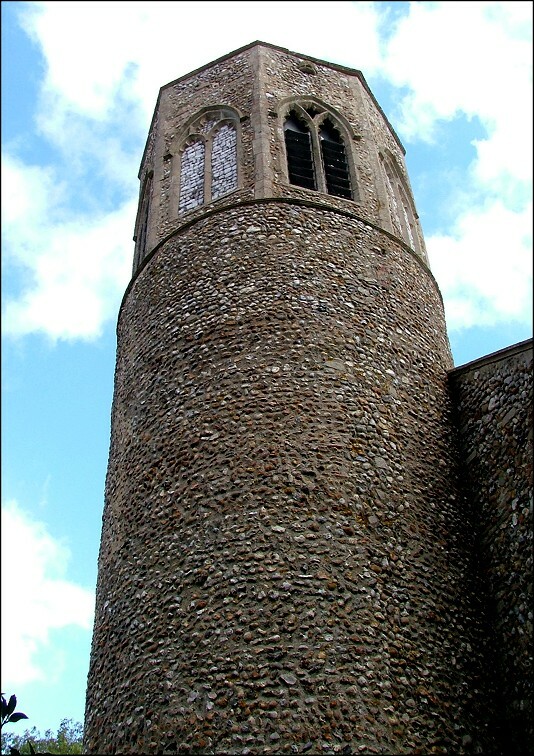 As if all this were not enough, two centuries earlier the Norman round tower had been augmented by a fine bell stage, the bell windows alternating with flushwork-filled blanks. As I say, there is nowhere quite like it. 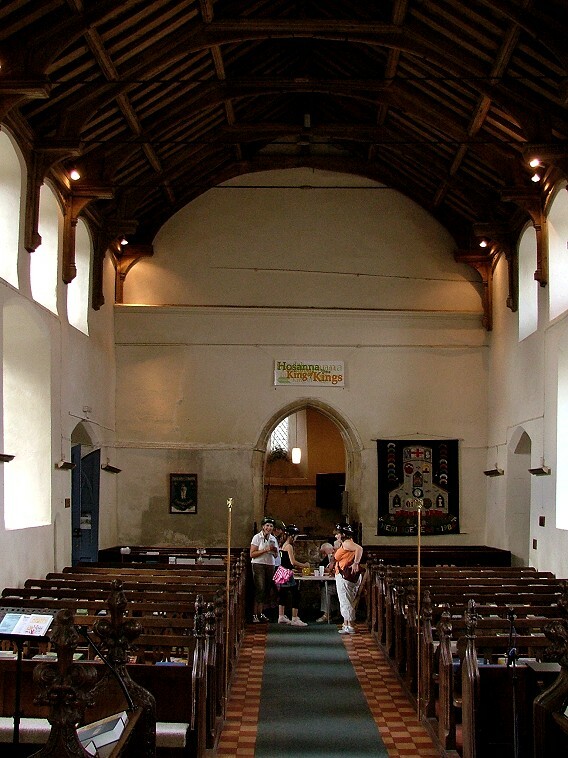 The red brick porch against the nave is 19th century, and there is a fine 20th century meeting room concealed on the north side. But it is the porch you step through into the body of the church. When they built the clerestory, they rebuilt the roof, and it survives today. It is an attractive colour, a counterpoint to the furnishings below, but the unusual proportions of the shape make the interior feel rather austere, and it would be hard to describe it as attractive, especially when looking west. 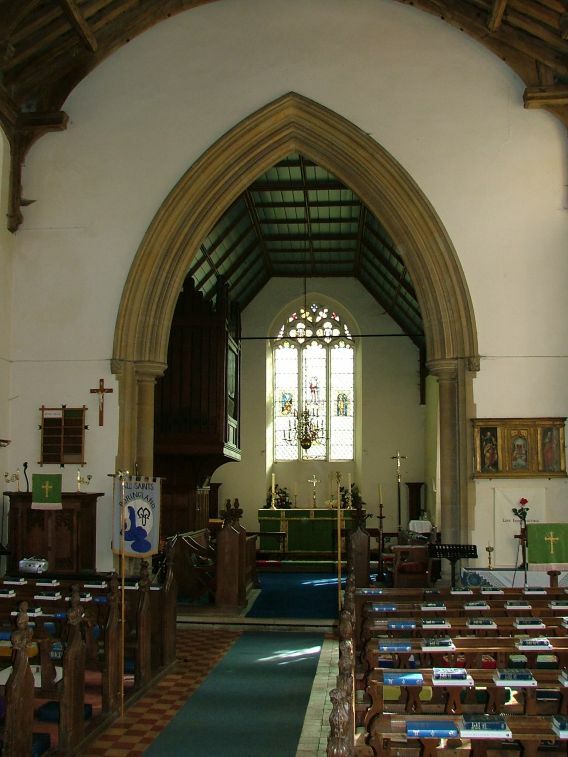 The 19th century restoration was rather severe, and has left the interior feeling a bit anonymous, although the chancel is much more successful. There was nothing attractive about him, nothing that would draw us to him. We despised him and rejected him; he endured suffering and pain. No one would even look at him - we ignored him as if he were nothing. All the while we thought that his suffering was a punishment sent by God. He was treated harshly, but endured it humbly; he never said a word. even though he had never committed a crime or ever told a lie. He is flanked by two other figures. 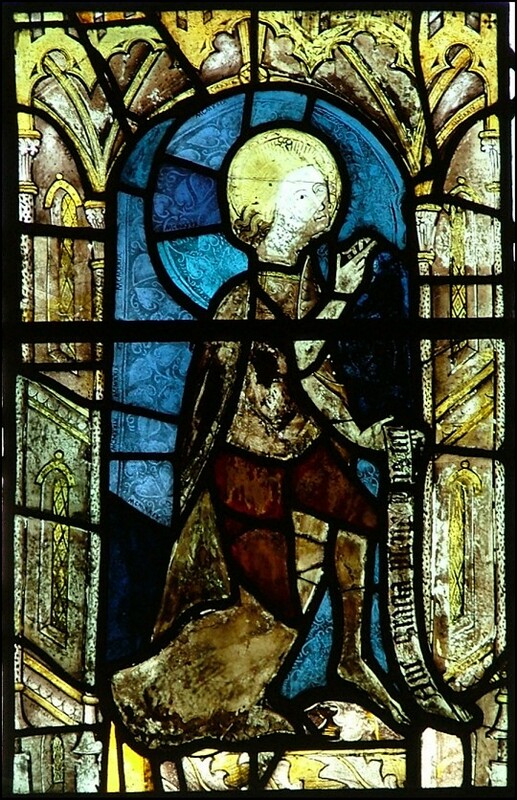 On the left is a composite; the lower half is, I think, the body of the Angel Gabriel from an Annunciation scene, holding a banner with the words Ave Gratia Plena ('Hail Full of Grace'). The wings have been lost, but you can just make out the stems of the lilies in his right hand. The head is that of a woman, I think. The figure on the right is an image of Christ as the Lamb of God, holding a cross and a banner. You can see the wounds in his feet. 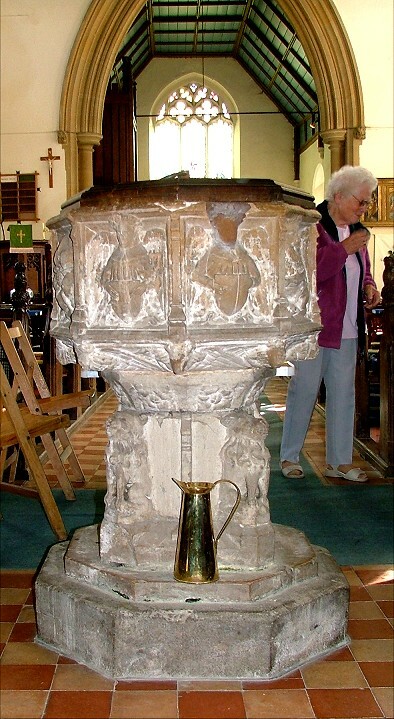 Back in the nave, there is a typical East Anglian font of the 15th century, looking very like those nearby at the two Shotesham churches. 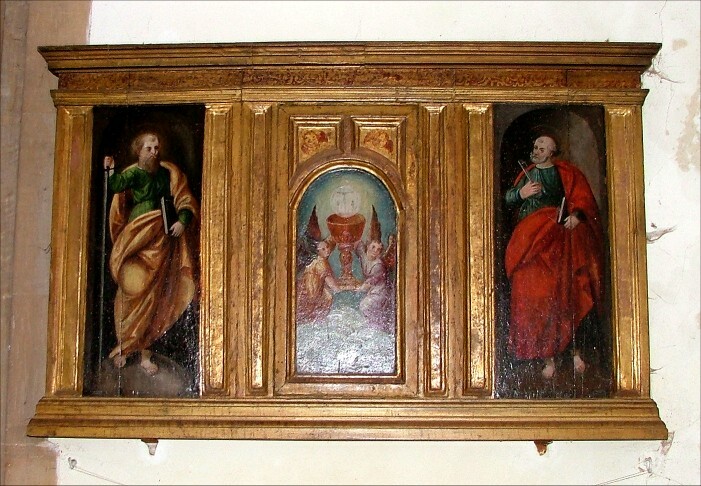 At some point, someone has collected a late medieval Italian altar piece, which now hangs in the nave. It depicts St Paul and St Peter, founders of the Catholic Church, flanking two angels raising a chalice to represent Christ. 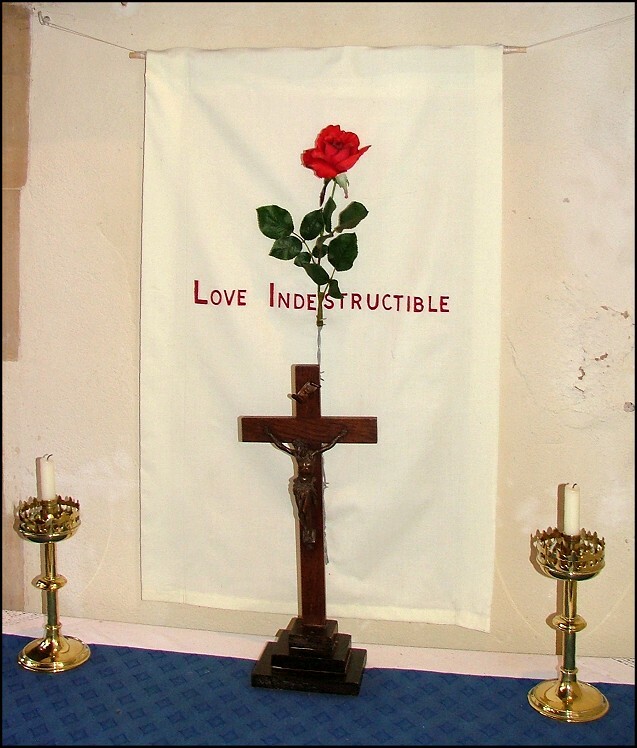 I loved the simple little altar below it, with its single red rose and the inscription 'Love Indestructible'. We came here on Bike Ride day, because All Saints is one of the 'fortress' churches, one of a handful of churches in East Anglia which is not open to visitors, strangers and pilgrims. I must tell you that the two ladies on duty were very friendly and jolly, and could not have been more helpful. Peter, who was with me, was pleasantly surprised. He had arrived on Good Friday 2004 to find the door locked, and a big sign saying the church urgently needed funds. While he was trying the door, a churchwarden arrived, but refused to let him see inside. Peter continues: I drew his attention to the 'funds needed' sign and said, "Why would I want to donate funds to a church that won't let me in?" "Churches have to be kept locked," he said dismissively. "They all are." "Oh well", he countered, "some of them might be open if they can find someone to be on duty all the time." Again, Peter had to contradict him. "I've found someone on duty at less than ten of the big ones, and only at Sandringham among the small ones." 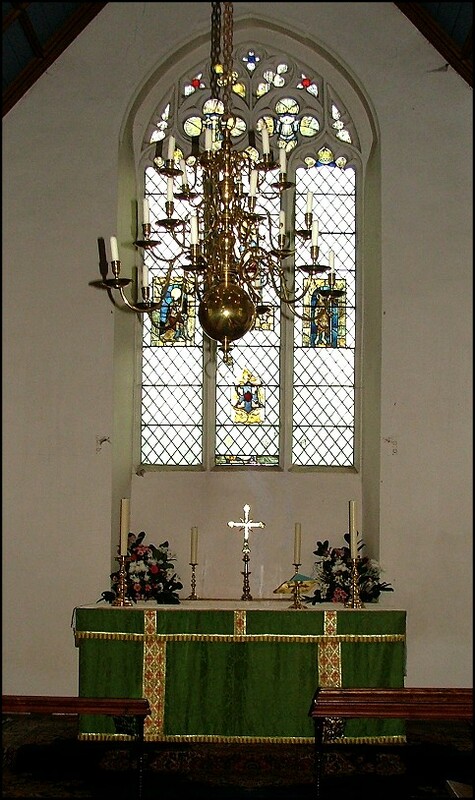 At this point, the churchwarden said he had to get on with his work, and suggested that if Peter wanted to see inside he should come to a service. Somewhat understandably, Peter wrote to the Rector about this altercation. 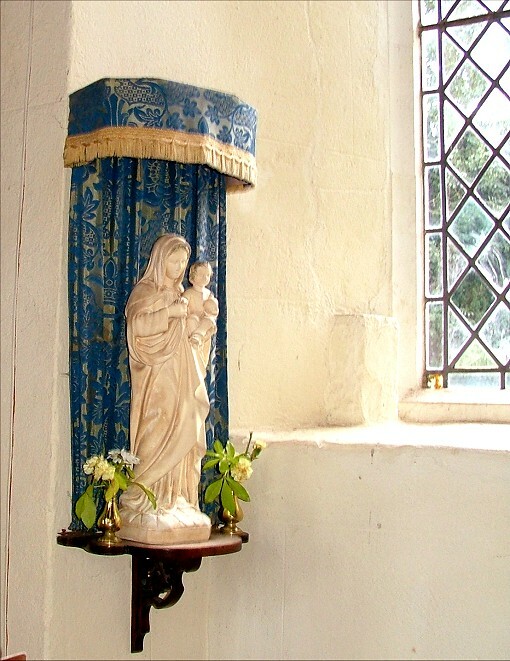 The reply was conciliatory; the Rector expressed sincere regrets and said how much he himself loved travelling round the county and finding small churches open. But, he continued, the problem with Poringland was that it was unfortunately near a school, and there had been a lot of vandalism. As Peter says, this is not easily confirmed; the next time he was in Poringland he stopped and had a look for broken windows, or signs of recently repaired ones, a new lock on the door, overturned gravestones and so on. Nothing. 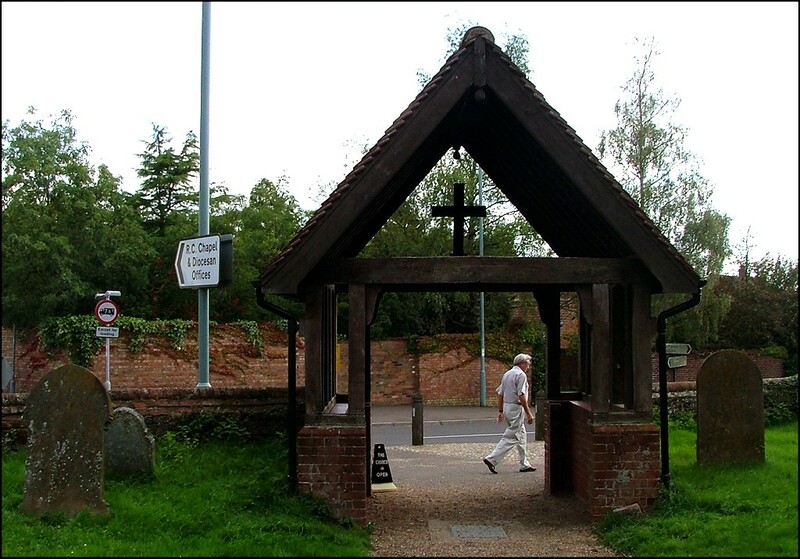 However, I am reasonably optimistic, because, as I say, the people on duty were very friendly; and, moreover, there was a traffic cone painted with the words church open in the lychgate. Surely they didn't make it just to use on bike ride day?